The new Nissan Leaf electric vehicle can go further between charges and has new drive technology with the possibility of driving with a single pedal. The electric car will be cheaper as well, although the top-selling electric vehicle in the world will not have the driving range of its biggest competitors. 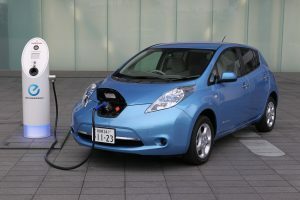 The vehicle, with zero-emissions, which Nissan Motor the Japanese automaker unveiled late Tuesday in the U.S. and in Tokyo Wednesday, will have a range of 400 kilometers in the driving conditions of Japan or 150 miles for the U.S., before it needs to be recharged. Nissan has called the extended driving an improvement of 40% from its previous range of 280 kilometers for models currently on sale. The distances are variable by country due to driving conditions and the measuring standards differ as well. The range depends as well on the other features that get used such as the heater. Both Chevrolet’s Bolt and Tesla’s Model 3 are able to travel 322 kilometers or 200 miles between charges. The mark of 200 miles is looked at by most industry experts as a range that is necessary to ease fears of drivers that they will run out of electricity prior to arriving at their destination. Nissan U.S. director of marketing for electric vehicles Brian Maragno said that the new 2018 Leaf would have a base price of $29,999 prior to a tax credit from the federal government of $7,500. That is an important price for current owners of Leaf, many of which will buy another Leaf. The Chevy Bolt, by comparison, has a base price of $36,600 and Tesla’s Model 3 has a base price of $35,000. The price in Japan is $29,000 or 3.15 million yen, with the version that is most expensive costing $37,000 or 3.99 million yen. The model will start in sale October 2 in Japan and in January for Canada, Europe and the U.S.
A Leaf that will have a range of more than 200 miles will likely be available from Nissan in 2019, said Maragno. Research shows that buyers of the Leaf wanted a vehicle that started at less than $30,000, but also wanted additional features. Even with added features, the price has been lowered $690 from the 2017 model. Nissan will not introduce its model with a range of 200 miles at this time since development takes longer said Maragno. While than mileage range is important for those in the U.S., he said in many other markets it was not that significant.